Discover the best of Rwanda in this 14 day Rwanda Tour. The Rwanda safari package actively engages you in different activities including gorilla and chimpanzee tracking, game drives, Boat trips, visit to the genocide memorial site in Kigali and a cultural experience with the locals. The Rwanda safari covers Volcanoes National Park, Nyungwe Forest National Park, Akagera National Park, Lake Kivu and Kigali City. Arrive at Kigali Airport where you will be received by a guide from our Rwanda tours and travel company before transfer to your hotel. You will also be taken for a Kigali City tour with a chance for you for you to visit genocide memorial sites and local markets as you interact with the indigenous and very hospitable Rwandan people. After breakfast you will checkout of the hotel and embark on the journey to Akagera national park which will take about 4 hours. Along the way you will be exposed to the magnificent landscape and scenery the land of a thousand hills has to offer. Upon arrival you will check-in into the lodge and have lunch. You will then go for an afternoon boat cruise on Lake Ihema where you will see vast hippos and crocodiles basking with elephants moving along the lake shores. There are also various bird species you will spot including the shoebill stork. Before retiring to the lodge later in the evening. Very early in the morning you will wake up and go for a game were you will see various Wildlife such as Elephants, Antelopes such Topi or Elands , Burchell Zebras, Buffaloes, Masai Giraffes, Savannah Birds, Monkeys, Leopards, Civets, Hyenas and many others. Before returning for lunch at the lodge. In the afternoon, you will then head for a guided nature walk where you will see the different bird species Akagera has to offer. Later in the evening you will go for an evening game drive where you will be able to see predator animals such as lions, leopards, hyena, civets and many more which usually do some hunting during the night. You will go for an early morning game drive where you will be able to see many animals as they graze early in the morning. Before climbing mount Mutumba where you will have a picnic lunch as you view the park from a panoramic perspective before transfer to Kigali. The early morning drive from Kigali to Butare takes about 2hrs 30m. At Butare you will visit the national museum. The museum displays a wide collection of monochrome pictures, traditional artifacts and objects, tools and different craft products. Ethnographic objects are grouped together according to the theme giving premium information on the daily life of the Rwanda people. You will then be transferred to Nyungwe forest where you will check-in to the lodge. The Rwanda chimp population of over 500 individuals resides in Nyungwe forest. Early morning you will go into the forest for the chimp tracking activity. Later in the afternoon you will go on the amazing Waterfall Trail one of the parks highlights. The trail stars from the Gisakura side of the park taking between 3 to 5 hours. The trail winds up and down steep hillsides through primeval rain forest where the trees are swathed in vines and the air is heavy and humid. The highlight is a secluded waterfall, where you can take a shallow dip. The guided nature walk into East Africa’s largest forest, Nyungwe starts early in the morning. The walk is not only popular for exposing Rwanda’s forest birds, but it also allow travelers to see some primates from the 13 available species, including chimpanzees, Mona Monkey ,Angolan Black Colobus and Owl Faced Monkeys. The eighth day of your Rwanda Safari will be spent at Bugarama Hot springs a 1 ½ hour drive from Nyungwe Forest. The Hot springs are here are large and travelers can have a dip / swim in the heated waters. Later in the day, you will proceed to the Rusizi River for a boat cruise before heading to Kibuye later in the day where you will spend the 9th day of your Rwanda tour. The ninth day of your Rwanda vacation will be spent relaxing as you reflect about your already past days of the tour. You may either chill from your hotel or even spend the day at the shores of Lake Kivu which will ensure that you will recover from safari exhaustion. Later in the day you will transfer to Gisenyi. You will spend the early part of the day relaxing on the beach before going for a nature walk along the shore. 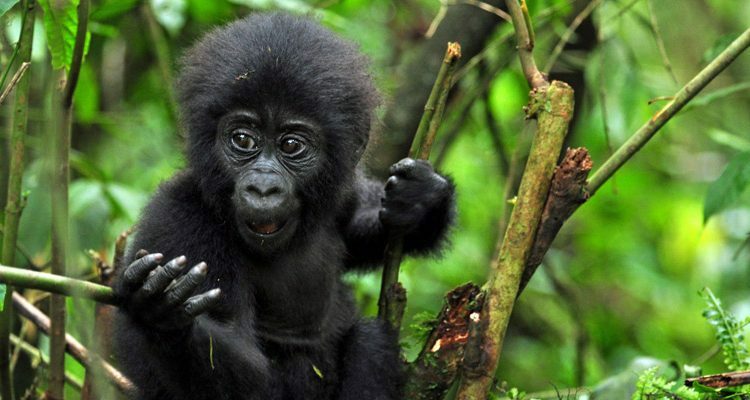 The Rwanda Safari will then proceed with a transfer to Volcanoes Rwanda’s primate and Gorilla haven. You will wake up early to have breakfast before heading to the park headquarters for a routine briefing about gorilla tracking. You will further be allocated a gorilla family to track. Your gorilla tour starts when you enter the forest on a gorilla trail, meeting the gorillas normally takes between 2 to 8 hours which is highly dependent on the movement of the gorillas. Later in the afternoon you may proceed for a nature walk at volcanoes national park. Parc nationale de Volcans is known for having a lot of primates including the golden monkeys which you get to track on the on the 12th day of your Rwanda safari. You will later proceed to visit Diane Fossey’s grave (Diane Fossey was an American researcher who researched about the Gorillas). You will later be driven to Lake Ruhondo and Lake Burera also known as the Twin Lakes. You will end your tour with a Kigali city tour if you had not had it on the 1st day before driving to airport.